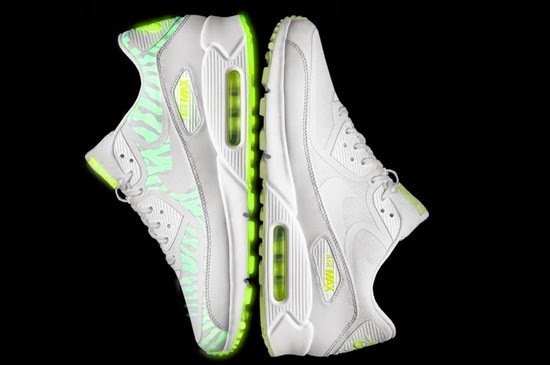 Three classic Nike Air Maxes get the "Glow-In-The-Dark" treatment and are now available. The Nike Air Max "Glow" Collection features three classic Nike Air Maxes along with one new style made for men and women respectively, all featuring "Glow-In-The-Dark" elements to them. 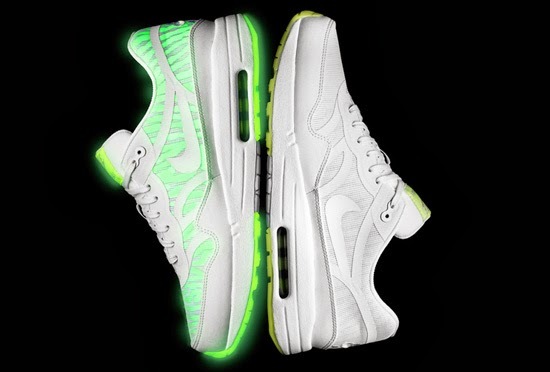 Three style for men which include the Nike Air Max 1, Nike Air Max '90 and Nike Air Max '95 alongside three styles for women which include the Nike Air Max 1, Nike Air Max '90 and Nike Air Max Thea were made for this "Blacklight" Pack. 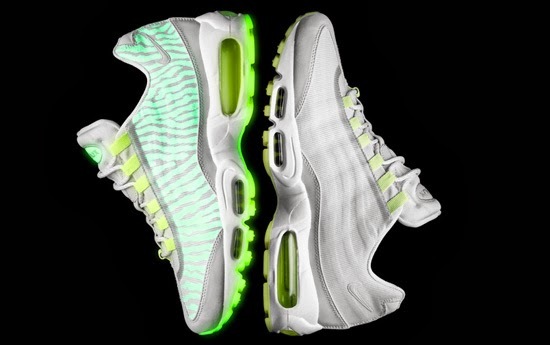 Each pair comes in a white, geyser grey and lab green colorway featuring glow-in-the-dark accents. Contrasting the crisp, white tape construction, under-mesh glow-in-the-dark prints illuminate during low light situations, each pair is a Premium Tape edition. All six pairs from this collection were a limited release on Thursday, October 3rd, 2013 and are now available at select Nike accounts worldwide. Retail on the men's pairs is as follows, the Nike Air Max 1 Premium tape at $110, the Nike Air Max '90 CMFT Premium Tape at $130 and the Nike Air Max '95 Premium tape at, $150. Enjoy the official images below of the Nike Air Max "Glow" Collection featuring the Nike Air Max 1 Premium Tape, the Nike Air Max '90 CMFT Premium Tape and the Nike Air Max '95 Premium Tape all in white, geyser grey and lab green. If you're interested in picking any of these up, check in with your local spots to see if they received them. Those of you looking for a pair now can, grab them from eBay here.